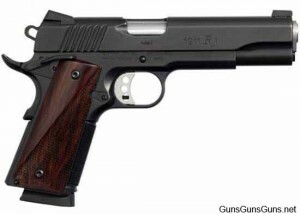 Summary: The description, specs, photos, pricing and user ratings for the Remington 1911 R1 Carry pistol. 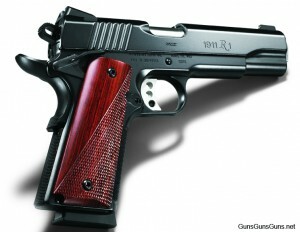 The Remington 1911 R1 Carry is a 1911-style semiauto pistol chambered in .45 ACP. Despite the word “Carry” in its name, this pistol is built on a full-size, carbon steel frame with a full-size, 5″ barrel. Remington reportedly calls it a carry pistol primarily because it features a de-horned frame and slide. .45 ACP 7+1, 8+1 5″ 8.5″ n/a 5.5″ 38.5 oz. This entry was posted in .45 ACP, $1,001-$1,250, $1,251-$1,500, 1911, Full size, Remington, Semiauto on October 15, 2012 by Staff.